Martin Gardner died on Saturday, May 22, in Norman, Oklahoma. 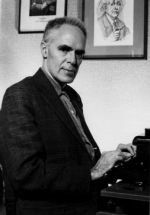 A prolific author and critic, Gardner was best know for his monthly column “Mathematical Games” which he wrote for Scientific American for twenty-five years. Beginning in 1983 he contributed a regular column “Notes of a Fringe Watcher” to Skeptical Inquirer where he debunked pseudo-scientific claims. Gardner attended the University of Chicago in the 1930s and graduated in 1936. After a short stint in his native Tulsa as assistant oil editor of the Tulsa Tribune he returned to Chicago to work in the University’s public affairs office. His semi-autobiographical novel The Flight of Peter Fromm is set on the U of C campus—in the Divinity School and its chapels in particular. The Press was privileged to keep a number of Gardner’s seventy-some books in print for many years, including The Annotated “Casey at the Bat,” Logic Machines and Diagrams, Hexaflexagons and Other Mathematical Diversions, The Second Scientific American Book of Mathematical Puzzles and Diversions, Martin Gardner’s New Mathematical Diversions, and Martin Gardner’s Sixth Book of Mathematical Diversions. In 1989 we published Gardner’s Why and Wherefores, a collection of his essays and reviews, including the excoriating review, under a pseudonym, of one his own books.